Faster Workshop is an F4SE plugin that optimizes workshop loading times by replacing some of the most expensive and inefficient regions of workshop loading code with far more efficient versions. 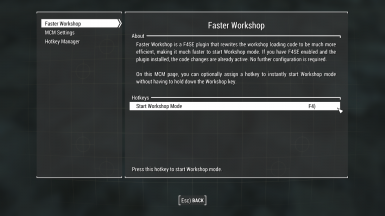 Also provides a hotkey to instantly enter Workshop mode and fixes workshop icon load lag. Mod Configuration Menu Only required if you want to set a hotkey for opening workshop mode instantly. Now supports any game version above v1.10.50. Improved icon load delay handling to eliminate micro-stutter during horizontal navigation through the workshop carousel. Faster Workshop is an F4SE plugin that optimizes workshop loading times by replacing some of the most expensive and inefficient regions of workshop loading code with far more efficient versions. Provides a hotkey to instantly enter Workshop mode. Fixes the issue with workshop icons not loading when navigating through them quickly. Testers with a current workshop load time of ~15s (from activating a Workshop to having the build menu appear) report a drop in load time to less than half a second. Those with a lower starting load time report near-instantaneous Workshop loads with the plugin installed. As you acquire more mods that add content to your game, you may have noticed the game freezing up (video freezes and you cannot move) for increasingly longer periods of time when you attempt to start Workshop mode. Even when these mods have nothing to do with the Workshop! It boils down to the game using some incredibly inefficient code to figure out what objects you can build in workshop mode. Whenever you start Workshop mode, the game evaluates the conditions on every single constructible object in the game to find out if they belong in the workshop - this includes even non-workshop items like weapon mods and chems. And it does that not just once (! ), but repeats this loop for each and every workshop submenu you have! If you install a mod that adds two new submenus to your workshop, one would reasonably expect to incur just a small overhead of a couple of additional checks. Instead, in reality, this causes two more loops through every single craftable object in the game. As you install more mods that add any kind of craftable object to the game, entering the workshop will inevitably and perhaps noticeably slow down, even if these objects have nothing to do with the workshop. And to make it all worse, every time you exit the workshop, the game tears down all this data it worked so hard to build and starts over! Do I need this mod? When you start workshop mode, is there any noticeable delay before the build menu appears? If so, this mod can help. This F4SE plugin rewrites code that handles workshop object loading. On the first workshop load of the game session, the plugin goes through the constructible objects once and maps keywords to their constructible objects. Now, instead of looping through the entire COBJ list every time a mapping of COBJ to KWYD is needed, it is a constant-time operation to look up this information from the prebuilt map. Conditions will now only be evaluated on COBJs that belong in the workshop category, instead of all loaded COBJs. Install with your preferred mod manager, or copy the files in the download to your Fallout 4 Data folder. Make sure that you start the game with the F4SE loader, otherwise F4SE will not be active. This is an in-memory code patch. It does not attach any scripts to objects or your save and is safe to install or remove at any time. Fallout 4 game version 1.10.50 or higher. Fallout 4 Script Extender (F4SE), 0.6.4 or higher. The Mod Configuration Menu, if you want to assign a hotkey for starting Workshop mode. Not necessary otherwise. Many thanks to the xSE team, for F4SE.